Continuing our little series on American Net Worth secrets revealed by the Federal Reserve’s 2013 Survey of Consumer Finances, I figured we’d zoom into a little segment of the population where more than a few politicians have made their careers: retirees. Okay, that’s a big segment. Regardless, let’s look at the Net Worths of households led by 65+ year olds in 2013. I’ll hold off on the heavy analysis, since these numbers generally speak for themselves. However, I will say this: the retiree set is the wealthiest demographic in America, before additional monthly payments are factored in (more about that in the next article). More than 60% of households headed by 65+ year old members have at least six-figures of wealth, and more than 10 percent are into the seven figures. So, how does this data shock you? Does it seem higher than you were expected? Lower? How would you value the income stream of OASDI or a pension for this demographic? Can you break it down further by buckets of ages from 65 on? That might expose some interesting insight on how retirees draw down their assets. I’ve got something in the works for maybe next week. Watch out for my lengthy disclaimer about the data points running out very quickly, but I can tell you that just by eyeballing it it’s going to be an interesting piece. Based on a 4% safe withdrawal rate, the median retiree’s non-Social Security/pension income is $8,420 per year. Supposedly, according to SAFEMAX (and SAFEMIN), assets are designed to cover 50% of your expenses; therefore, the average retiree is spending $16,840 per year. That seems quite low to me. 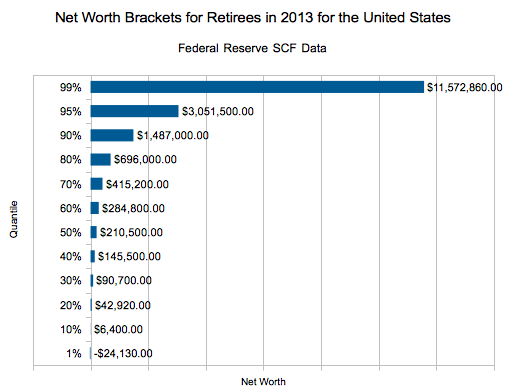 I suspect the reality is that the average is skewed by the high net worth retirees. The $1 million to retire anchor seems blown out of the water here, but it begs the question of what sort of retirement these people have. Social Security, at $1,294/month per person in 2010, makes up 37% of income for retirees aged 65 and over (see: http://www.fool.com/retirement/general/2014/12/01/average-retirement-income-its-grim-but-you-can-bea.aspx). So, roughly $1,995.67/month per median/average retiree. Either a lot of retirees live very sere lives, they keep working, or something is not adding up in the numbers. The average social security check is $1294. Thats $15528 a year. Add the $8420 and you get $23,948. Plus pension incomes on top of that. Theres also business income, rental income, etc and theres no reason to assume that a typical retire is following the 4% rule. Actually the median household income for people over 65 is around $33k. I agree with Jim – the numbers pass my sniff test (and I don’t have any averages skewing the data here, this is all net worth quantiles). Many retirees do lead sere lives. They watch pennies, stay home nearly all the time, watch TV, and eat cheaply. I know several in my locality who live like that and have very meager existences as a result. At that, their lives are superb compared to the desperate straits that besiege many of the world’s most extreme poor. that is surprising that it looks so good but then I have to imagine that you need about $1M by my estimates to last 20-30 years AT LEAST. So .. Only 10% are in really good shape. the following method has worked well for me, albeit it never is consistently smooth because of market fluctuations. for each million of liquid net worth at 65, if you draw at 5%, ie $50000 at the start of the year, and the market yields 8%, below its historic average, your end of year balance is $1026000. increase your withdrawal by 3% for inflation and repeat the process the second year and your end of year balance is $ 1052460, (1026000 – 51500) x 1.08. in the third year, the ending balance is $1079368, (1052460 – 53046) x 1.08. the key is that the portfolio balance never decreases, which is critical, because once it does, its like a snowball rolling down hill, decreasing at an increasing rate to evaporation. no, it doesn’t work this smoothly, but if you have depth and flexibility, you can weather the storms. and yes, the more millions you have at the start, the more depth and flexibility you have at the storms. The problem with some of the comments is working with averages. For example if we look at two people, one with zero savings and one with $1M the average is $500,000 which poorly represents both. Another example is that average life expectancy has increased … mostly because of a reduction in infant mortality rather than living longer. My point … averages have a use but can be VERY misleading. Additionally, don’t forget pensions (and similar). Some people with low savings have good pensions. So annual spending levels are not simply a matter of savings and SS. I might revisit it at some point and work pensions into the math, but, yes, I agree with you – it’s good to use centiles as we did here. When it comes to programs like Social Security, though, it’s a little safer to use averages because benefits are capped – you wouldn’t expect someone to be making $1,000,000 a year off Social Security, for example – but, regardless, if we revisit we’ll look at the centiles. 1). Traditional pensions have disappeared for most people. 2). Many retirees can’t withstand the volatility of high equity exposure. Bond and cash yields are at historic lows. So investment income for many seniors is a small fraction of what they had planned. Traditional pensions were never as common as now appears to be assumed. Small farmers, small entrepreneurs, shop workers, etc. throughout most of history seem to have relied on family and savings for life after work. Keep in mind that working til they dropped was more common before retirement became entrenched in personal lives.